Stocks are modestly green on a lower unemployment rate, but is the lack of a move good or bad for the rally? Stocks gaped at the open on stronger than expected employment, but sold off to break-even in the first hour of trade. After briefly dipping into the red, stocks bounced back and are stuck somewhere between the open and early lows. It is interesting to see the market’s tepid reaction to one of the strongest jobs gains we’ve seen since the recovery began. We need to figure out why it didn’t surge higher and what this says about where we are headed. This was the perfect recipe for a short squeeze and momentum chasing. What happened? Part of it is the diminished role employment played in recent months. A year ago the market held its breath for each employment report, but now it is just another data point. Going from losing jobs to gaining jobs was a major turning point, but going from 150k to 200k gains is less meaningful. The more concerning explanation is if we are running out of buyers and no matter how good the news, the market is stuck without new money to keep pushing prices higher. Are we finally out of buyers or are reluctant holdouts are just being stubbornly difficult? I’ll be honest, I expected more out of the market this morning. When it doesn’t behave the way I expect, it makes me nervous because it means I am missing something. We are obviously getting close to a top, but I thought we still had a bit further to go given the persistent and widespread cynicism. The lack of a surge today means could be closer to the top than I expected. While we are still trading in the green and I don’t want to pull the plug prematurely, I am less confident and moved my stop up to 1530. Holding 1540 this week is supportive of the market regardless of the headlines and reluctant money managers only have a few weeks left to buy this bull before quarter’s end. Of course there is no reason to keep holding for the last few dollars of upside. The market rallied nearly 50 points since breaking back above 1500 last week and taking worthwhile profits is never a bad idea. We are in this to make money and the only way to do that is selling winners. 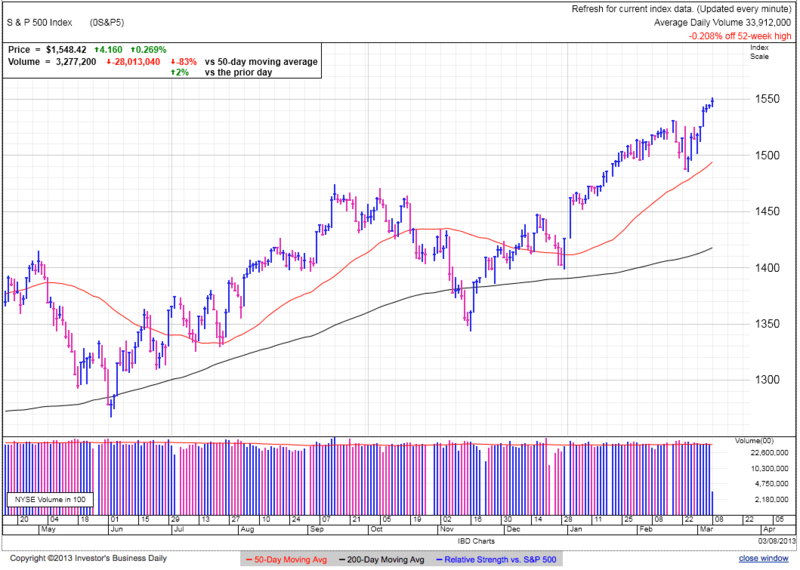 The risk of an imminent top jumped this morning when the market failed to find a large pool of buyers after a decent employment number. If the lack of buying is because no buyers are left, we will head lower no matter how good the news. The market is still holding gains and is not breaking down, but it is enough to make me raise my stop-loss to 1530. A closer stop-loss increases the chances of getting shaken out in a normal market fluctuations, but until I see stronger performance out of the market, I’ll keep it on a short leash. AAPL is stuck between $420 and $435. Bottom-pickers come in below $420, but follow-on buying fails to materialize above $435. As tempting as it is to call a bottom, there is no material supply and demand reason or change in sentiment to justify a reversal here. In fact this pause is encouraging the hopeful and sucking in dip-buyers, making a continued selloff even more likely. This stock needs big money to back it up and right now institutions are selling, not buying.